At the core of all telecommunications products is the ability to connect callers to each other for conversation. Pilgrim's products enhance that essential experience by offering an easier and more exciting connection. Our applications are built with a focus on our partners' business needs and consistently achieve high rates of task completion while providing for high levels of user satisfaction. Many of the world’s leading telecommunications companies have relied on us to fulfill their application needs and thereby help them to achieve their business objectives. Our Conversational Services allow users to communicate in the most instinctive manner possible, empowering them to enjoy a better, more intuitive experience while making new friends on the phone. Although customers continually demand more features and more capabilities, they also require technological simplicity. The capability of choosing between person-to-person or group instant voice communication in both wireless and wireline environments offers end-users at least one configuration of product and technology that they can access comfortably. Pilgrim's Conversational Services include group teleconferencing (chat), group instant voice messaging (Connections™), anonymous calling, dating, entertainment, psychic and community service programs. Pilgrim developed its proprietary technology, the Connections™ class of services, as a response to the growing need for users to meet new friends safely and anonymously with the smallest possible time investment. For our international users, conversational services encourage social communication and self-expression between different cultures and languages. Connections™ products are provided with a comprehensive set of the wide-ranging services required to handle the minutiae of customer inquiry, billing, and reporting. A popular and fast way to meet new friends for general conversation on-line. 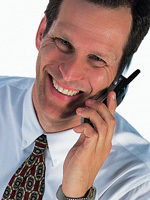 Pilgrim offers web and phone based conversational programs for its customers through its PILGRIMTELEPHONE.COM service. Connect and instant message with people from your neighborhood or from around the world. Widen your social universe safely and conveniently. Talk live and privately or juggle conversational threads with dozens of friends at the same time. Pilgrim's Connections™ class of service products empower users to expand their social circle by enabling them to easily and safely search for and meet others who share the same interests. Once inside the Connections™ product, individuals initiate their experience by defining their profile and releasing it to the system. This profile is presented to other users through an easy browse feature. Telephone numbers are private and cannot be exposed without user consent. All users browse others profiles. When they identify someone they want to talk to, they simply send an instant message. They will receive an instant message in return if that person wants to talk to them. At any point, users can request a live conversation, if the request is accepted by the other user,the two are connected to talk privately. As each user hangs up, their profile is instantly deleted from the browse feature. Unlike traditional messaging systems where users must wait for hours, days or weeks to get a response, Pilgrim Connections™ users can exchange messages with other community members immediately. Because users are on-line at the same time, Connections™ users get instant gratification, generate high premium rate usage, and become frequent repeat callers. Pilgrim's Connections™ services are the highest revenue community messaging services in the industry (including wireline voice services, personals, and chat/IM/WAP services), generating revenue, hold times and repeat usage patterns several times any other chat, messaging or information service. This extraordinary end-user acceptance demonstrates that Connections™ services meet the customer's need for an intuitive, easy way to socialize by phone, quickly and easily. No text chat service can compete for reach, revenue, and retention. • Professional, highly skilled operators providing room administration and moderation support. • Users access any time, day or night, and find themselves right where the action is. Rooms are busy and conversations are lively with lots of interesting people. • Participants speak their mind or just listen in; it's up to them. As anonymous callers, users maintain complete personal privacy while in a chat room meeting and talking to new people. • Callers search a well-conceived chat room directory for a specific room or a specific topic. Rooms are defined as open and closed rooms for public discussions or discussions within a predefined group. Sports: Customers meet in the SPORTS channel to discuss the latest sports events. Callers ride home from work or sports events and discuss the game with other fans on the speakerphone. Flirting/Dating: Customers who want someone to talk to about life, love, family and relationships create their own community. Those who are searching for romance with like-minded individuals safely and successfully meet many new friends. Pilgrim's #DATE service is perfect for customers looking to speak with someone else through the #DATE personals voice mail service, or to join discussions on traffic, horoscopes or a wide variety of other topics. Customers can obtain information through Pilgrim's #DATE information services on issues of concern to callers, and through the real time directory can get referred to the lines containing information being sought by the caller. Celebrities: With our #Chat capability, users meet in chat rooms to speak with SPORTS, MUSIC, MOVIE, MEDICAL and LAW celebrities and experts. On Pilgrim's #CHAT service users can obtain information on issues of concern to callers by discussing them with celebrities and experts, and through the Pilgrim #CHAT real time directory can get referred to the lines containing information being sought by the caller. Callers can also leave questions and observations in voice mail boxes and receive responses from other callers to the #CHAT service. Pilgrim's #CHAT service is access by dialing one of Pilgrim's access lines. Traffic: If an accident suddenly backs-up traffic for miles in each direction on a major highway, callers in the area dial a special access code to join the TRAFFIC & WEATHER virtual channel to exchange information and advice about the situation. Truckers: Long haul and night drivers meet and chat on the open road, keeping each other awake and alert. Travelers: Users looking for entertainment or VISITORS to a new city, join the city information channel, and talk with others about the best spots for a good meal, a decent hotel, or for assistance understanding the local highways, tunnels and bridges. Pilgrim's Voice Personals product represents a response to expressed consumer needs and preferences in the emerging on-demand, location-based audio market. Our voice personals product enables end-users to look for like-minded companions in any part of the country. Voice Personals have grown from humble beginnings as a small feature of alternative newspapers to well-accepted mainstream multi-page features of most major-city dailies. Currently our voice-driven product segments end-users by geography and gender. Future enhancements include options for age and interest. Copyright 2006 Pilgrim Telephone, Inc., All Rights Reserved.